Is the question often debated late on a Saturday night after a few glasses of vino. Well it makes a change from religion or football and is a very important question in this tuna producing region of Spain-Andalusia. Sat 23/1/16: After taking NiKi out on the road again after week on site we headed back down from another pueblo blanco -Arcos de la Fronteria and after the usual round of getting lost and scaring the locals as we inch down tiny roads we made it back to our lovely campsite in Vejer. 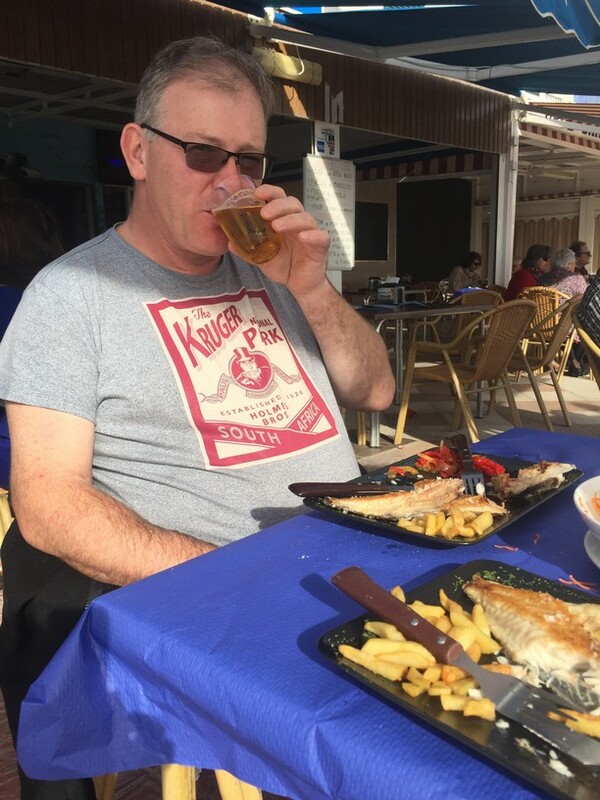 We had had a lovely lunch of tapas in Arcos in a small back street bar after ignoring the guide book choice of a tapas come flamingo bar and so weren’t desperately hungry, now getting into our swing of either lunch or dinner, not both. Our wonderful hosts were still sitting in the bar area of the campsite after obviously having finished their evening meal and so we headed over to say Hola. 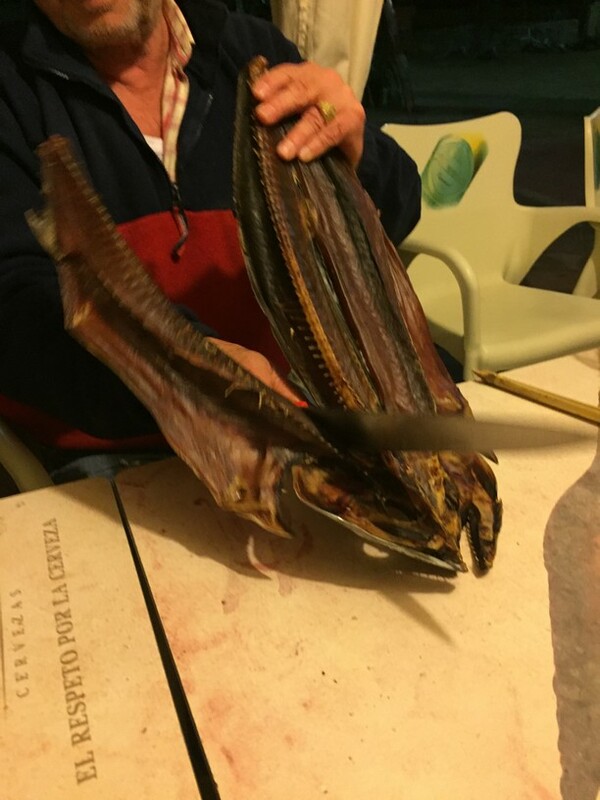 After a few more Hola’s and the usual charades and google translate time had passed and to our surprise out came this giant flattened smoked kipper looking thing for us to taste- a delicacy and usually served as a hor d’oeuvre. It was actually a type of tuna that is line caught and then salted and dried on the fishing boats for about 2 months (can be longer)as they are pulled out of the sea. This is where the debate began –Miguel saying that it thought it could have been dried and salted for slightly longer and Juan saying No it was fine. It then lead to whether this fish called Bonito is just a small tuna or not a tuna at all. We couldn’t really add much to this debate either knowledge or language wise as we certainly had covered that level of conversation in the last weeks lessons!! So we just took the opportunity to munch our way through it with much appreciation as ever. 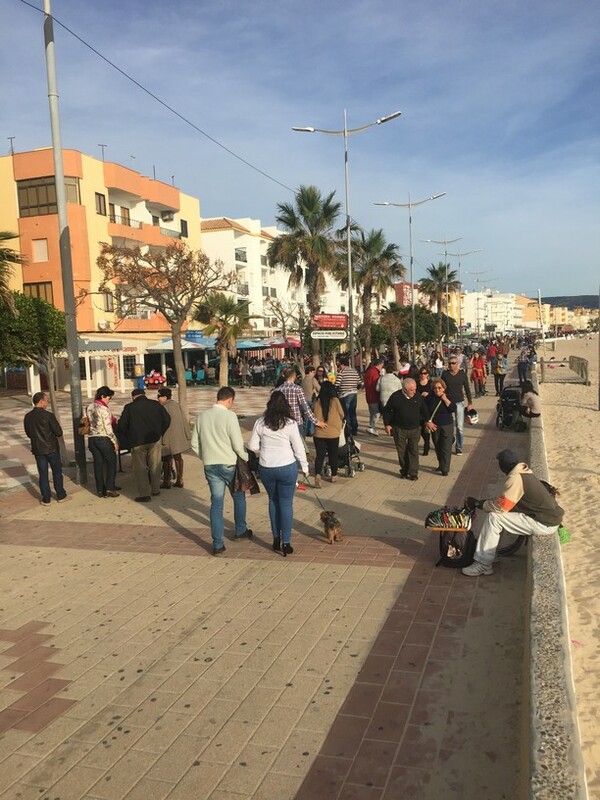 Sun 24/1/16: The sun was shining again and so we ‘hopped’ on our bikes and cycled to the local town and beach called Barbate to see what further tuna delicacies we could find for lunch. There is a huge tuna factory in Barbate and also a museum of tuna which we are hoping to get to visit before we leave as well. Our teacher had recommended 2 restaurants that specialised in tuna and so we tracked them both down. Neither was on the beach and the much dearer one and in fact very dear one was closed and the other was in a side street and had no outside eating area. So still true to our UK form we opted to find an outside restaurant with a sea view. I don’t think personally I’ll ever get to pass on a view and a sunny seat but watch this space come August!. There was a lovely spring family feel to the promenade, with families old and young walking, riding, chatting and of course eating. A choice had to be made between us and after a few cycles up and down we chose Casa Oscar which had a wonderful menu of all things tuna and more besides. We opted to share a starter of tuna tartare and it was ‘melt in month’ stuff. Fish of the day was next for us both unusually for David and it was two smaller individual size fish rather than one large one to share (always wise to have your own when ‘sharing’ with David) I did this time forget to ask the waiter to write down the name of the fish a) so we could see if it translated and b) to order it again should the occasion arise. No pudding was taken but an ice cream and another little walk and sit in the sun before we wobbled off on our bikes. For those of you worried that the wobbling was too much to drink on my part it’s not- I seem to have this ability not to be able to cycle the bike certainly from starting position without wobbling and weaving. I am one of those cyclists that you cringe at when you’re driving- hopefully I’ll improve!! Locals taking the air at Barbate. It’s 20 degrees. Tues 26/1/16: The decision had been made early that we were going to have the menu del dia in our ever favourite reenergising bar Manolos and so after our usual downhill march and a slightly odd and to begin with worrying stop from the Guarda Civil- who it would appear just stopped to offer us a lift we plonked ourselves down in the bar area. The menu seemed to be much the same as last week but as far as we could understand with a change or two. We opted for more or less the same starters as last week- soup picadillo for David and soup with fish and potatoes for me. The potatoes in mine as they were last week tasted just lovely. They ‘mush’ but don’t collapse in the soup and take on all the flavours, really very tasty. David was convinced that this week his soup was more eggy but given his egg phobia he was quite happy and said it added even more to the taste- an egg convert in the making me thinks. Pork and beef were opted for as main course and again served very simply, no sauces, no ‘jus’ just a few chips and a green veg. Oddly for both of us no pudding just coffee then €16 to the good we continued our walk home, full and happy!! Very true was hoping to shrink a little before going to the next size down. No chocolate here.